Since we’re a bit obsessed with Breath of the Wild after having played it for a little over a week now, Rachel and I found ourselves discussing what we would be doing if we were in Link’s shoes. 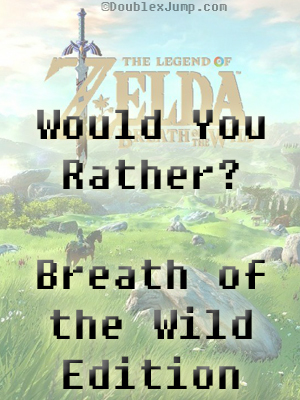 It prompted us to do another round of “Would You Rather,” this time for Breath of the Wild. So, Rachel, would you rather live in Kakariko Village and assist Impa or live in Hateno Village and assist Purah? As much as I love Impa, I’d have to say Hateno Village with Purah. The tech stuff seems really cool and I would love to have the beach right there. Kris, would you rather only have the paraglider assist you to get around or only horses assist you? Aww, what a tough question! While I love the paraglider and flying around, I would have to go with horses. There may be places where I wouldn’t be able to have them accompany me, but I would love the animal companions. And who doesn’t like horsies? Alrightie, would you rather have the shrines be all combat orientated or physics and puzzle based? Physics and puzzle based… You know me, I run from a fight. Would you rather go through the game using only tree branches as weapons (or the next weapon level up) or never be able to heal yourself (never be able to cook)? Oh, geez… Considering how much I die, this is a tough question… You know what, I’d rather go through the game never being able to cook. I’m too interested in the multiple weapons to only go through the game with silly tree branches! Would you rather game over from battling a tough opponent or from falling off a mountain after running out of stamina? You would never beat the game then, haha! I would rather die from an opponent. At least I’d have a little dignity from that death. Would you rather only have close-range weapons or long-range weapons? Like, only have swords and spears or only have a bow and arrows? Augh, I love both the swords and the bows in this game! Despite how horrible my initial aiming would be (I would hope I’d get better with practice), I think I would choose bows. The different number of arrows — ice, bombs, electric — alone would be fun! The long-range and going against armored enemies would be a fun challenge as well. Last one, Rachel: would you rather have lived 100 years ago and been a Champion while trying to rid the world of Calamity Ganon or wake up 100 years later with Link as being the last hope against Calamity Ganon? Neither… I told you earlier, I’d run away from a fight. I’d probably have to say wake up as Link. We all know Link would win in the end and I’m not keen on dying. Awesome format to discuss some really interesting aspects of the game, as usual. Great job, girls! I ended up not mentioning it when I wrote my review, but I thought there was an excess of combat-based shrines. If the guardians were more versatile enemies, or if Nintendo had gone out of their way to create a larger variety of mini-bosses to put inside those shrines, that amount would have been ok. As it is, they are a bit too repetitive. I would also go with horses! I love the paraglider, but there is something awesome about moving through Hyrule’s main roads and watching the scenario shift right in front of your eyes. There is so much beauty and detail to find in Breath of the Wild, and the best way to admire it is on horseback. I realized while playing last night that the guardians are pretty easy once you know all their moves, and especially if you have powered up weapons. Especially one with Shock. You can just tear into them and keep interrupting their attacks! Naturally, I happened upon not one but THREE “Major Tests of Strength” in a row, and didn’t take one hit. Just broke a lot of swords! Yes, there’s not really much to them. Electric weapons turns them into very vulnerable enemies. While I totally don’t mind combat in the games, there were definitely moments when I stepped into a test of strength shrine and walked right back out because I knew I didn’t have the weapons that I would have needed to defeat it right then and there. I agree that there could definitely be more variety in the shrine bosses, if you will. The puzzles are interesting! We recently did the Swinging Flames shrine, where you’re supposed to use the swinging lamps to strategically burn patches of leaves to reach chests, open doors, etc. My strategy was a bit different: Fire arrows everywhere! I can relate to that strategy! It’s so much FUN! I love the variety of arrows in this game, haha! Me too. I spent most of my rupees on arrows! Personally, I’d go with the paraglider over the horsies. Problem with the horses is that the landscape terrain is so varied, that I normally end up having to ditch the horse anyway, which makes me sad. The paraglider is durable and is usable in most scenarios. As for the shrine puzzle/combat question, I’d definitely go more physics puzzle based, but I’d like them to be larger. I LOVE the ones where you have to get a ball to fall in a hole to raise a platform, but they could be more intricate. Perhaps less shrines that were bigger would have fared better than MORE shrines but that are smaller. And I don’t particularly care for the combat shrines. Once you figure out how to take down guardians, you can easily fight them without taking a single hit of damage. The paraglider is so much fun, but I am a sucker for animals. Like you said, however, the terrain can be so varied that I usually kept my horses safe in the stables, haha! I literally shut off the game at one point when my horse accidentally wandered into a group of monsters I was fighting and was devastated when the horse started getting hurt! Less shrines with more of a balance between varied combat based ones and puzzles would have been preferable, I think as well. I just recently learned how to more successfully fight off the guardians, so I’m still practicing that! Still love this and all your answers! I’ll take a go too! Would you rather go through the game using only tree branches as weapons (or the next weapon level up) or never be able to heal yourself (never be able to cook)? Probably not being able to heal, as long as I can get the max number of hearts, haha! Would you rather game over from battling a tough opponent or from falling off a mountain after running out of stamina? Tough opponent, because it’s more depressing to not clear a mountain because of lack of stamina. Would you rather have lived 100 years ago and been a Champion while trying to rid the world of Calamity Ganon or wake up 100 years later with Link as being the last hope against Calamity Ganon? 100 years ago, because then at least I would recognize everyone and they would recognize me. I’m really interested in your answer for the last question! Most people enjoy the idea of being with Link, but your answer makes more sense. Better to fight and die with friends than to live without remembering any of them. We haven’t unlocked too many memories just yet, but I have a feeling most are going to break our hearts, just as officially meeting Mipha did!